Amanda E. Lewis is Professor of African American Studies & Sociology, and Director of the Institute for Research on Race and Public Policy at the University of Illinois at Chicago. Her research focuses on how race shapes educational opportunities and how our ideas about race get negotiated in everyday life. She is the author of Race in the Schoolyard: Negotiating the Color-line in Classrooms and Communities. 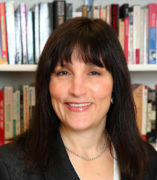 She is also the co-editor (with Maria Krysan) of The Changing Terrain of Race and Ethnicity, and co-author (with Mark Chesler and Jim Crowfoot) of Challenging Racism in Higher Education: Promoting Justice. Her latest book (with John Diamond) is Despite the Best Intentions: Why racial inequality persists in good schools. Her research has appeared in a number of academic venues including Sociological Theory, American Educational Research Journal, American Behavioral Scientist, Race and Society, DuBois Review and Anthropology and Education Quarterly. She lectures and consults regularly on issues of educational equity and contemporary forms of racism.